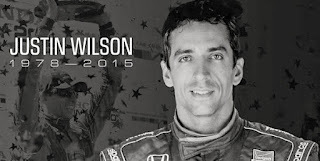 Wilson first competed at the Indianapolis Motor Speedway in the 2003 United States Grand Prix, finishing eighth and scoring his lone Formula One championship point of his career. Beginning in 2008, Wilson had competed in eight straight Indianapolis 500 races (2008 - 2015), finishing in the top 10 three times, with a best finish of fifth in 2013. Wilson also competed in the Verizon IndyCar Series Grand Prix of Indianapolis in 2014 and 2015. He is just one of three drivers who has competed at the Indianapolis Motor Speedway in the United States Grand Prix, the Indianapolis 500, and the Grand Prix of Indianapolis. Elizabeth J. Musgrave writes two magazine food and wine columns: Destination Dining and White Linen & Corks,and is a travel, features, food and wine writer, travel and food photographer, and performing arts and restaurant critic. Catch her as the Travel & Leisure Adviser on FOX59 Morning News Show. She also is a speaker, consultant and media trainer. Follow her on Twitter @GottaGo, LinkedIn and Facebook.